Benjamin Robinson. The Skin of the System: On Germany’s Socialist Modernity. Stanford University Press, 2009. Twenty years after the opening of the Berlin Wall, a number of important thinkers (one thinks here, in differing registers, of Alain Badiou, Boris Groys, or Susan Buck-Morss’s 2000 Dreamworld and Catastrophe) have been reconsidering what to make of the twentieth century’s experience of really existing socialism. Is socialism a political and economic order—a discrete historical period for certain large parts of the globe? Is it a political project, an emancipatory vision and potential that stalks and shadows capitalism through its various stages and guises? Or even a particular mode of semiotic practice? In other words, what are our categories for thinking through “socialism”? 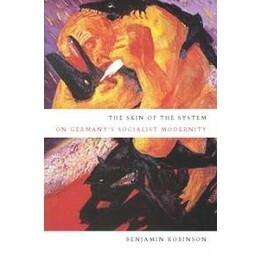 Benjamin Robinson’s The Skin of the System is a notable contribution to this discussion insofar as the book asks these questions directly, situating itself in the opacity between socialism as utopia and as actuality (to paraphrase a chapter title). Framing really existing socialism as a form of modernity is, as Robinson stresses, only the beginning of an answer. “The challenge socialist modernity posed—and still poses as a legacy,” he writes, “is not the challenge of alternate criteria per se, but of understanding how roughly the same criteria could refer to two distinct systems of modernity and to the qualitative difference between these systems” (222). The specification of that difference was a life project of Franz Fühmann (1922-1984). The Skin of the System takes its literary case studies from Fühmann, particularly his later works, but it is not to be taken as a literary biography or monograph (we have a number of these already, including those by Hans Richter and Dennis Tate). Rather, this is a book about the relationship between literature and economics, as well as science and society. Robinson’s book, to put it another way, takes up and amplifies Fühmann’s own question of what difference socialism makes. A Sudeten-German of bourgeois Catholic upbringing, Fühmann experienced his Damascus moment, converting from true-believing fascist to committed socialist, in a Soviet POW camp. For Fühmann and many others of his generation, socialist commitment was framed in terms of complicity with Nazism and the attempts to negotiate guilt, both private and collective; “my generation came to socialism via Auschwitz,” Fühmann would write in his Twenty-Two Days or, Half a Lifetime. Fühmann would spend the rest of his life limning the contours of this conversion, writing and re-writing it, holding it against the obscure text of East German socialism. For Robinson, in the face of the increasing social inertia of the GDR after the decline of the Communist futurological utopia of the mid-1960s, the catalyst of Fühmann’s mature works is “the anxiety that socialism might be a difference that makes no difference” (112). Working across genres and drawing from Greek mythology, the Bible, fairytales, Hegel and Marx, but also Nietzsche and Freud, cybernetics, German Romanticism, and socialist realism, Fühmann cobbled together one of the more remarkable oeuvres in East German letters in an attempt to take the measure of socialism’s event and to measure the poles of his own conversion. While studies proliferate on East German cinema and social historians continue to challenge and refine our notions of how things worked in the GDR, we have not, with few exceptions, seen a major English language study of East German literature since the late 1990s, when Julia Hell’s Post-Fascist Fantasies (1997), with its exploration of the Oedipal complexities of East German antifascism, and David Bathrick’s The Power of Speech (1995), which argued for literature as a vehicle for late modernist interventions into the GDR’s complexly constrained public sphere, framed the discourses in which GDR literature continues to be received and taught. It will not be possible now to discuss East German literature without also discussing this book, and this is what Robinson’s book shares with those two books: its ambition to re-situate the critical discourse on GDR literature into a contemporary theoretical project. In reading Fühmann’s oeuvre, Robinson links the discussion of East German literature, and state socialism more generally, to current debates on modernity, biopower, and sovereignty. Robinson does this through a fascinating discussion of fascism, liberalism, and socialism as systems of modernity, distinguished by their respectively privileged regulative media: the camp, the law, and the plan. Fühmann’s work is then read as a subtle apparatus for registering the slippage between these orders. “Fühmann’s project,” Robinson tells us, “distinguishes itself as an experiential search for the qualitative difference represented in the search for a socialist sovereignty of the GDR” (117). The recurring lesson of Fühmann’s writings and Robinson’s book is that the borders of this qualitative difference are not in fact where one expects to find them. is whether critical scholarship should ‘emancipate’ the kernel of real socialism—as a set of utopian ideals carried by an independent popular culture—from the context of a discredited institutional history; or should that institutional history and the culture that emerged with it form a primary basis for our understanding of what was distinctively socialist about ‘socialist’ culture (22)? In other words, instead of dismissing really existing socialism as no socialism at all, or as an absence of liberal modernity, why not attempt to grasp what it was on its own terms? Terminology is in fact perhaps the most interesting and complicated aspect of Robinson’s book, since it very much avoids the terms in which the GDR tended to thematize itself, either the ossified Marxist-Leninist discourse of East Germany’s official public sphere or the “jargon of authenticity,” to paraphrase Adorno, in which dissent from the GDR’s general line was often formulated. What we get instead is a theoretical vocabulary largely drawn from Plato and Aristotle, the analytic philosophy of W. V. O. Quine, and the systems theory of Niklas Luhmann. Yet, if Robinson’s sources here seem eclectic and perhaps counter-intuitive for the study of East German literature, they open onto an important discussion of socialism as a philosophical, indeed ontological, question. Thus, Robinson’s readings of Fühmann are informed by a series of classical philosophical dilemmas of differentiation, which will guide our attempts to understand socialism in terms of systems and the antagonisms of system boundaries. Drawing on the discussion of mud and mana in Plato’s Parmenides, Robinson sharpens the theoretical dilemma posed above—is really existing socialism a system or is it not? For Robinson, this question is ultimately that of what Quine refers to as ontological commitment, which has to do with the coordination of provisional symbols to establish reference. This is what we seem to lack for socialism. What we have is the “mud” of the system, its “mundane world of queuing and spying” (44). This inert triviality of everyday life is not formless from Robinson’s perspective, and neither is socialism an empty signifier, as Lévi-Strauss famously characterized mana. The question then becomes one of measure, or more precisely, of qualifiers. What allows us to refer to socialism not as nothing, but also not as merely empirical data—as some thing? This brings Robinson to the question of systems, since the provisional qualifiers that allow us to make reference to the some thing that is socialism are not only signs in a semiotic economy, but also indexes; they force us to react to them. In this sense, the index becomes operational in its capacity of marking “limits, boundaries, separations,” in other words, what Robinson is after here is the concept of a medium of the system, provided that we understand that “medium is not (to begin with) some third thing distinct from system, but is the way a system comes into being as a unity of difference” (50). In other words, a medium supplies the system with internal relationality, but an internal relationality in the form of “a limit marking the site of an encounter with another system” (54). This conception of socialism has consequences on the level of representation, which is to say, it gives socialism an event that can and must be narrated: the “new story” of socialism is change itself, but this is no straightforward affair. In a number of adept readings of texts from Fühmann, Robinson shows us how Fühmann’s seemingly innocuous stagings of scenarios of transformation culminate in acts beyond measure. There is, for example, his stark portrayal of the flaying of the satyr Marsyas at the hands of Apollo, God of music and measure, and “The Heap,” a science fiction tale in which a researcher from the year 3456 is given the task of provi ng that socialism has solved the philosophical quandaries of class society by attempting to ascertain the precise moment that a bunch of metal screws becomes a heap—a work that ends in an outbreak of chaotic violence. This metonymic violence, standing for the measurelessness of a leap across systems, is countered in Fühmann’s work, and here Robinson’s readings are particularly instructive, by his attention to the problem of duration and of the quotidian. The problem of the incommensurability of the sudden moment of transformation increasingly gives way to that of how the detritus of the everyday could possibly be read as an index of a socialist sovereignty in Fühmann’s later works. Disillusioned by the GDR’s stagnation under Honecker, he begins to articulate (as did many others at this time) a discourse of Germany’s “abject modernity” of power and humiliation, of complicity and betrayal. In his analysis of Fühmann’s essays on the late Romantic E.T.A. Hoffmann, Robinson writes: “for Fühmann it is no longer the unheard-of of transformation, but the heard-of of triviality that counts” (259). Fühmann recognizes the aporias, the undecidability that his society has opened into modernity without being able to close again… Fühmann’s inventions capture the necessity of a system whose simultaneously real and impossible difference from modernity causes the violence of sovereignty to turn in on itself (239). As much as socialism was an other system, an opening vis-à-vis the increasingly sclerotic and crisis-ridden circulation and exchange of our own late modernity, it was also in the end undecidible in and of itself. After the expulsion of Wolf Biermann in 1976 and Fühmann’s marginalization as a public figure in the GDR, his ontological commitment to socialism again founders on this inability to find it, and “mud, dirt, indignity—that is really existing socialism—imposes itself between Fühmann and the mana of sovereignty (262).” For a writer like Fühmann, in this stalled dialectic, this filth of really existing socialism could only be renounced on the penalty of reverting to fascism. This is not, to be sure, the choice we face in our own difficult conjuncture, but despite the events of 1989, this opening of undecidability into our modernity remains, and we can begin to perceive it in the limitations to capital that seem everywhere on the horizon. On the coming undone of neoliberalism, see Gopal Balakrishnan, “Speculations on the Stationary State.” New Left Review 59 (2009): 5-26. Bathrick, David. The Powers of Speech. The Politics of Culture in the GDR. Lincoln: University of Nebraska Press, 1995. Fühmann, Franz. Trans. Liela Vennewitz. Twenty-Two Days or Half a Lifetime. London: Jonathan Cape, 1992. Hell, Julia. Post-Fascist Fantasies: Psychoanalysis, History, and the Literature of East Germany. Durham: Duke UP, 1997. Richter, Hans. Franz Fühmann. Ein deutsches Dichterleben. Berlin: Aufbau, 2001. Tate, Dennis. Franz Fühmann: Innovation and Authenticity: A Study in his Prose-Writing. Amsterdam: Rodopi, 1995. Hunter Bivens is assistant professor in the Literature Department at the University of California, Santa Cruz. He received his PhD from the University of Chicago for his dissertation “Concrete Utopia: History and Labor in the German Communist Novel.” He has presented widely on postwar German literature, film, and culture and published on the work of Anna Seghers and Brigitte Reimann. His current project, tentatively titled “Expropriated: Spaces and Affects of East German Literature,” analyzes representations of space in East German and post-GDR cultural productions, elucidating the conflicting legacies of both socialist and capitalist models of industrial modernity.